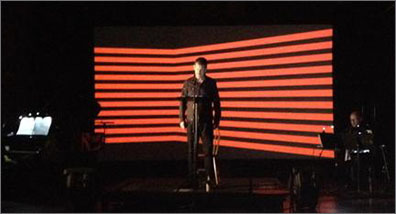 Premiered at Issue Project Room, Brooklyn, October 2014. The opera depicts the final moments of philosopher Walter Benjamin’s life in Port Bou at the French-Spanish border as he flees Nazi-occupied France. From his studies of Benjamin's texts and letters, Sharp has created a dramatic interpretation of Benjamin's internal reality on his last day, drawing reference to the hugely influential author’s key works including The Work Of Art In The Age of Mechanical Reproduction, The Task of the Translator, and The Arcades Project. Starring the extraordinary bass/baritone Nicholas Isherwood, with pianist Jenny Lin and accordionist William Schimmel, and prerecorded electro-acoustic backgrounds by Sharp. 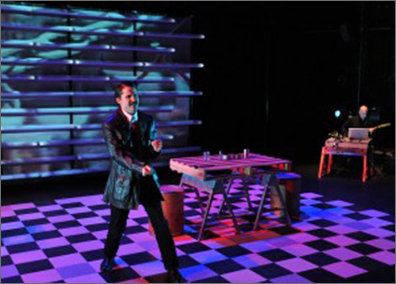 Video projections by Janene Higgins provide the set and staging, as well as subtext and commentary. ﻿﻿Scored for accordion (William Schimmel) and piano (Jenny Lin) and blended with pre-recorded electroacoustic music, the soundtrack aptly mirrored Benjamin’s state of mind: eerie, haunted and at times cacophonous. Mr. Isherwood vividly conveyed the stream-of-consciousness monologue, with its biblical lines in Greek; excerpts from kabbalah; German profanities; guttural, gasping noises; and philosophical observations. ...Compelling components, like the alluring projections by Janene Higgins, depicted naturalistic and historical elements in fast-moving succession. 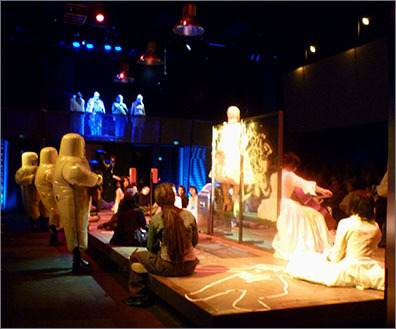 Commissioned by the Bayerische Staatsoper in Munich for their 2010 Summer Festival series in the Mini-Opera Pavillon. A science-fiction story about a Singularity opening our dimension to creatures from another who were only visible to teenagers and were able to catalyze unpredictable and highly creative acts among those teens. Societal and parental reaction was the source of conflict in the story. "About Us" was part of the Opera's educational outreach program. The project was to be an opera for all-teenage performers, between the ages of 14-18, with the cast consisting entirely of volunteers residing in Munich. In addition to composing the music, Sharp also created the script and story as well as directing the production. 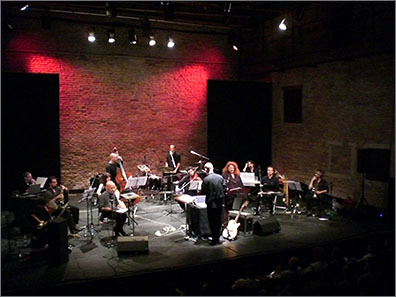 Em/Pyre is an opera commissioned by soprano Donella Del Monaco for the 2006 Venice Biennale to be performed by her with her regular ensemble a collection of musicians whose backgrounds and technical skills varied greatly. She also requested that Sharp perform with the ensemble and conduct the piece. Longtime collaborator Steve Piccolo created the text and sang the baritone parts. The strategy was to create a composition to be developed in a week of workshops leading up to the premiere. It was based on Sharp's interpretation and comparison of Venice in the 15th century with New York City in the late 20th century - two towering city-states whose empires both devolved due to both internal and external cultural and political/economic factors. The composed core materials and defined structure were to be elaborated through conduction and the manifestation of simple algorithmic approaches as well as guided improvisations based on the core materials. A CD of Em/Pyre was released in 2010 on the Italian label Opusavantra Studium. Premiered at Studio PASS in NYC, 1981. 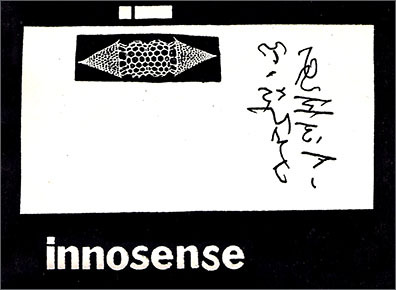 Innosense is a post-apocalypse opera set in a basement in the Lower East Side. The three "live" characters are the "Three Improvisers", here performed by Charles K. Noyes on percussion, Lesli Dalaba on trumpet, and Sharp on fretless electric guitar, soprano sax, and bass clarinet. The characters Bio/logicals, The State, and Myth are all prerecorded and played back from stereo cassettes, one for each of the performers. Materials for these characters includes vocal and instrumental sounds made by Sharp, found sounds, sound effects, and texts both written by Sharp and appropriated from various sources. Voices for these characters include Victoria Vecna and Felipe Orrego. The Geoclock is a prerecorded percussion track performed by Sharp and plays back continuously. Recorded November 1981, zOaR Music.